Etiquettes, Table Manners, Social Engagement are few postures that have to be remembered thoroughly & throughout the life. To ingrain these qualities early & easily in them, children are served lunch which is simple nutritious & balanced in the utmost hygienic condition. 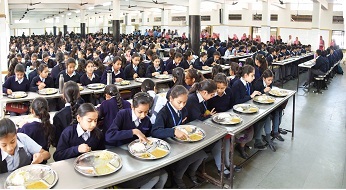 The school has a spacious dining hall where about 800 students can take lunch at a time.